Prospective adoptive parents who are approved by their agency will meet 25-30 teens who would like to be adopted. Families and youth will participate in fun activities, enjoy watching a hip hop dance troupe and eat lunch. There is no fee to attend. Registration is limited. Sorry, children and relatives of prospective parents may not attend. We'll have an online registration form available shortly. President Mr. Obama: the new black male role model? Today we are proud to have a guest blogger, Dr. Chuck Williams. He is an Assistant Clinical Professor and is the Director of the Center for the Prevention of School-Aged Violence at the Goodwin College- School of Education at Drexel University. He hosts a radio talk show on The Big Talker - 1210 AM and hosts his own blog, Dr. Chuck Speaks. Question: Will Mr. Obama replace traditional negative role models for young black males in America? Some seem to think a President Obama will usher in a new era, if you will, as it relates to models for young black men. This could be key, given that most folks feel that one of the major problems, as it relates to violence and chronic underachievement among black male youth, is that their familial and media models are poor examples of moral, positive and socially desirable behavior. So, if it is the case that Mr. Obama will offer a new positive image of a successful black male, super imposed over readily available negative ones (a situation further exacerbated by the marked lack of appropriate familial models), he may actually serve as a catalyst for a social paradigm shift in the black community which has been a long time coming. This vision speaks to me personally. I grew up in foster care and was never adopted, certainly a recipe for failure. But, unlike most young people in similar positions, I found an inner strength that pushed me to achieve and to be successful. To a large extent, appropriate familial models aided in my eventual success. As someone who has worked as a counselor, educator and community leader for more than a decade, I have found, at least anecdotally, that young black males tend to parrot and embrace the socially undesirable behaviors and self-fulfilling negative images, which have been packaged and marketed to them by those who, ironically, look like them and claim to have their best interest at heart, i.e., BET. This unfortunate situation is then reinforced by the overwhelming access to negative familial models-- drug addicted mothers and chronically incarcerated fathers and older brothers who spend more time in youth detention centers than school. However, as one can imagine, these black youth are unaware of the full implications of this. Moreover, sinister and unaccountable black media executives , who are responsible for much of this media induced mess have foolishly decided that this social poison should be created, given that it "reflects black culture." Therein lies the rub. (This does not suggest that so-called black pop culture is, by default, all evil. I've just purchased T. I. 's new release Paper Trail, and his song "Live your life" is very apropos this discussion.) We, as a community, have allowed the lack of appropriate familial models and "urban media" to solely define who young black males are and what they should become. While I can't claim to understand all of the variables or life dynamics which may lead an individual to choose one path versus the other, what I do know is this: The best buffer against negative images is a loving and caring family who loves you and is there for you through good times and bad, a family who will give you security and guidance and help you become the best that you can be and provide for you positive familial models. That’s why I’m an advocate for placing children who lack appropriate guidance from familial models in adoptive families and encourage those in our community to open their homes and their hearts to the many young people, including teenage boys, who wait for families to want and love them. I know too that there’s been no successful collective effort towards encouraging our young black males to choose education, a profession and career outside of the drug, sports/entertainment arenas. By reinforcing stereotypical media images we have enabled young black males to engage in behaviors fraught with unnecessary risks and diminished returns. That is to say, they tend to throw caution to the wind and embrace goals and beliefs which are far reaching, irrational and non reality-based. In the absence of appropriate familial models and support, they are left to their own childish devices. Also, young black men, who lack appropriate familial models, tend to hold dear to non reality-based, black media induced ideals and goals, while ignoring any opportunity for reasonable and necessary approximations toward goal attainment...of any sort. That is to say, their goals are profanely out of sync with reality. Yet, instead of acknowledging this point of fact, they become more aggravated by the fact that society does not give in to their non reality-based view of goal attainment and they begin to see society as the 'enemy'. Once this adversarial approach has been adopted by the young black male, the anti-social and overtly aggressive behavior, i.e., adopting the gun and drug culture, begins. Moreover, in the mind of the young black male, such behavior is more than justified under the guise -- "They won't let me reach my dream, so I gotta do what I gotta do!" There tends to be a lack of motivation about these young black men. Some falsely characterize this phenomenon as 'laziness,' yet this would be a misnomer. The avolitional behavior which can be observed, or the appearance of not having interest or applying effort is a manifestation of 'chasing the impossible’. If you know that you want to be a millionaire, tomorrow, but you're a high school drop out, living in your mother's basement, you're probably not going to appear to be too motivated. This is because intuitively there's a sense that your goals are in fact unrealistic, but given the irresponsible decisions that have been made, which have led you to the basement of your mother's home at 23 years of age, without a high school diploma and/or post-secondary training, feeling as though you’re 'in too deep' or 'too far behind' creates a sense of social lethargy. This of course is facilitated by the casual and regular abuse of large quantities of marijuana (blunts) and alcohol. Yes, the perfect storm. The core issue here is the reinforcement of this glorified and unrealistic lifestyle, by inappropriate models and the unconscious assimilation of readily available negative media stereotypes. Let me be clear: life for a young black male, even with good homes and decent parents, is not without its significant challenges. There's institutionalized racism, low-expectations, lack of regard, lack of support, social barriers, etc. However, as Dubois once stated "with all we accomplish all." So, one could argue that it is now time for positive familial models and popular media to encourage our young black men to pursue a path which can lead to them becoming a PhD, business owner, tradesman, teacher, decent father, loving son, or President of the United States. It is my hope, that the very presence of a President Obama will cause the black community to seize this opportunity to re-cast the die and challenge these erroneous media created assumptions which send our young black men to prison or the morgue, not the White House. moreover, having a child in need, who lacks appropriate familial models, placed in a loving and caring adoptive home will take some of the weight off Mr. Obama's shoulders. A version of this post appeared on his site last week. 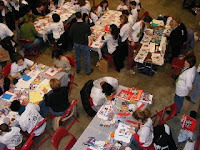 Yesterday we were at the MLK Day of Service organized at Temple University. We'll have more pictures up later, but here's a few to give you a taste of the day. 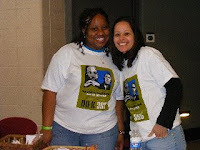 We had a booth where other volunteers could find information about our programs. Above are Crystal and Sheina running that table. 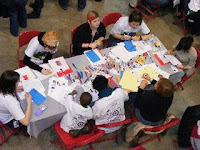 We had volunteers from Moore College of Art who helped us build quilts honoring those children who have and are currently assisted by our programs. 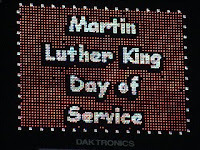 On Monday we will be participating in the MLK Day of Service. Our project is to make quilts with the faces of the children we have or are still assisting in their journey towards permanence. Here are some pictures of the quilt in progress. In the first few you are seeing how each square for the quilt is made -- each image of a child must be transferred to the cloth. We wish to thank Sharon Kenny of Kenny’s Imprintables and her artist with a press, Brent. 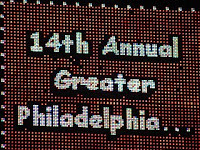 On Monday we'll be at Temple University to complete the quilt with volunteers from Moore College of Art and local corporation. We post pictures and thanks after the event. The motivation for this is MLK's example of service and compassion for his fellow man. We'll be sharing the following with those who come in person, but I'd like to share it with you now too. This essay was written by a teenaged member of FAIR. His passion and understanding grew from experiences in his own family, built through birth and adoption. As the nation celebrates the birthday of Dr. Martin Luther King Jr., people remember his message of bringing justice to all human beings through non-violent methods. Dr. King fought not only for the rights of African Americans, but for the rights of all the oppressed. Perhaps if he were alive today, he would be marching and fighting for the thousands of children without families. The unadopted children face the same kind of dilemma the Blacks did in King’s time. Excluded systematically from the system which controls them, children are shuttled from foster home to foster home, often suffering abuse and neglect in the bureaucracy which cares nothing for their fate. With the remembrance of Dr. King, we remember the origins of the civil rights movement, especially the quiet determination of Rosa Parks. Ms. Parks broke the chain of power which held her and her fellow Blacks repressed. Her message is mirrored by the families and parents who take children into their families. With quiet determination and tough decisions, parents silently break the chain of loneliness locking up a child. Many such parents have no such grandiose ideals; they simply want to parent a child. Neither did Ms. Parks identify her actions as historically monumental. Ms. Parks and thousands of others went to jail for their actions and beliefs. Some paid with their lives, and nearly all paid with sweat and pain. Adopting is likewise often a struggle, a struggle to understand, a struggle of restraint, a struggle to love. Most adoptive parents can tell you their pain with unaccepting relatives, with children who tell them they don’t care about them, or with old histories buried in confused young psyches. But while the civil rights demonstrators had to learn no-violence to not fight back, parents must learn an even harder kind of non-violence: they must learn to love, nurture and understand. Dr. King was a great man with enough room in his heart for all his fellow men. The unadopted children of this country would have a spokesperson who would bring their plight before the public and expose the injustice heaped upon them. 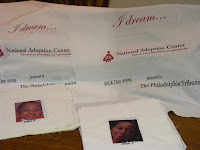 Parents need to tell the world about adoption, especially the adoption of older and special needs children. Rosa Parks took her seat, but it took Dr. King to organize a boycott and desegregate the Montgomery buses. The children need a Dr. King to stand up for them and demand their rights. Dr. King taught us enough that perhaps we can pull together and save the children. The civil rights movement fought to change the laws, the unadopted children need new laws to protect them. Martin Luther King had a dream. We need to keep that dream alive for our brothers and sisters, sons and daughters who do not share our families. Here at the Center we've heard reports of, and assisted many families with varied adoption-process-related problems. Issues we've heard about are calls that never get returned, being passed over in consideration for a child for no stated reason(s), or other communication-related problems. I'm sure that there are other issues, but for now let's focus on communication. What problems have you faced in this area? I would welcome answers from both sides, the professional and the potential family. Do you have any concrete solutions to resolve these type of issues? How could the Center help you (again this is for people on either side of the equation)? How can we work together to solve these issues? This holiday season we were fortunate enough to be the liaison between some very generous people and youths who are in foster care. These are youths we recruit on behalf of, but who still are in care, not permanent homes during this holiday season. Wendy's Crew members from local restaurants raised funds and then went on a shopping and wrapping frenzy! In the pictures you can see Wendy herself delivering packages with other Crew members and NAC staff. We thank Bob Bechtold and all the Crew for making this happen. 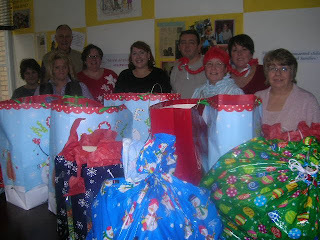 Pam Lee, Association Account Executive, Marriott International guided the giving from Marriott International. Marriott & Renaissance Global Sales held an annual open house where gifts were collected. Many Marriott employees also went out and purchased additional gifts & all collaborated in wrapping to make sure each child got all that he or she listed. Here you can see the Marriott van delivering the gifts. Our adoption coordinators then got to play Santa and deliver these gifts. Even driving late into Christmas Eve to ensure delivery didn't dampen the joy of seeing the youths open their gifts. One girl who asked for books remarked that "I'm going to read for the rest of the year!" A foster mother remarked that another boy's Christmas was made by receiving all that was on his wish-list. All in all, the children, families and coordinators shared smiles and lots of joy. Thanks to all who made this possible! Last night I had the pleasure in attending a workshop on using blogs to help nonprofits succeed. This event was organized by Philly NetSquared. It was a fun and exciting night. You'll see many of the tips I learned last night come into being here. Going forward, we are going to continue working together as a nonprofit community to help all of us reach the next level in our work. Some changes that will be coming immediately are: We'll bring more of the stories from the field, so you can see what we do on a daily basis to help children and youths find permanent homes. And we'll be including lot's more pictures and links. If you have any tips or ideas for topics you'd like to see us cover, leave a comment. We here at the Center want to wish you and your family a happy and healthy 2009. This holiday season was a quite one in the adoption world, with little news to report. We have many exciting programs, events and virtual happenings planned for this year. So stay tuned!